Phytonutraceutical supplements include vitamins, minerals, amino acid with natural extract used to boost the nutritional content of the diet and it is a safe health supplement for hair growth. By category, natural extract, amino acid, minerals with vitamins provides a huge array of products for consumer needs. The all dietary supplements mentioned in this combination including plants are Borage Oil, Garpe seed extract, Green tea extract, N-Acetyl L-Cysteine with vitamins and minerals, each of which purport hair promoting effects by various mechanisms. ● Improving skin and scalp condition. ● Borage oil is one of the best sources of gamma linolenic acid, commonly referred to as GLA. Folliculitis is the condition of inflamed hair follicles. This condition can occur on the scalp and wherever hair grows. Borage Oil can repair these follicles and keep them functioning well. More Borage Oil hair benefits are that it combats dry, itchy scalp and replenishes oil. The healthy fat in GLAs may help to delay male baldness, as well as other types of hair loss. Taking borage oil hair products daily can encourage new hair growth while preventing further loss. ● N-Acetyl-L-Cysteine (NAC) may also provide antioxidants that help to combat aging factors, such as hair loss. It can triple the amount of hair that is grown during the hair growth cycle. ●Grape Seed Extract: contains linoleic acid which penetrates the hair cuticle to smooth and protect it to create healthy hair that shines. It helps moisturize dandruff and other dry scalp condition to create healthy conditions for hair growth and also inhibits the production of the hormone dihydrotestosterone ("dht") in the body. studies have shown that dht is one of the major hormonal causes of suboptimal hair health for both men and women. ●Green Tea Extract: Green tea extract contains epigallocatechin-3-gallat, or EGCG, which promote growth of hair follicles and stimulate the human dermal papilla cells to boost hair production. Green tea can increase your metabolism. A faster metabolism may increase your hair growth rate. ● Niacin: Niacin's most important function related to hair growth is that it increases blood flow to the surface of the skin. Without adequate blood flow and circulation in the follicles, hair cannot grow or remain healthy. But by increasing that flow, not only will hair be stronger and healthier, it will grow faster. 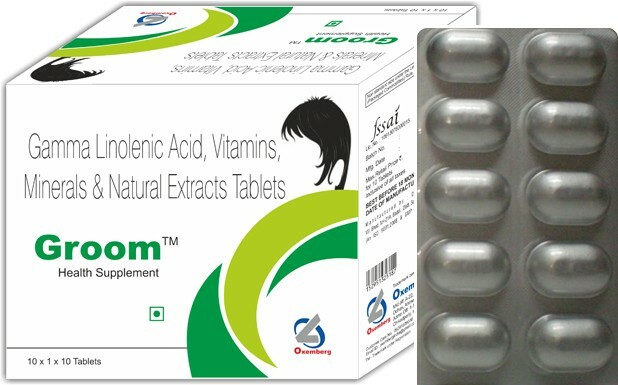 ●Biotin: Biotin, also known as vitamin H or coenzyme R is a water- soluble B vitamin. It will make your hair grow faster and thicker. ●Choline: choline supports the healthy balance of the body which has a huge impact on the health of hair and scalp. It increases effectiveness of inositol to protect hair follicle membranes and works together with inositol to form lecithin, a lipid that is needed to form hair cells. ●Inositol: This is used to help inhibit hair loss and allow healthy hair to grow back. Also, it is used by men and women to treat thinning hair, and it has anti-oxidant properties that keep hair follicles healthy. ●Zinc: Zinc is necessary for the production of sebum, which is the natural oil produced by the scalp and is necessary for healthy hair. Zinc helps to keep the scalp conditioned, preventing dandruff, and keeps the hair shaft healthy and strong. ●Copper: Copper is an essential element in the diet that prevents graying of hairs. ●Selenium: Selenium benefits for hair are twofold. First it aids in promoting hair growth and second it prevents dandruff. ● The Product is a promising dietary supplement that will enrich your hair follicles with all required vitamins and minerals. These vitamins and minerals are capable of enhancing cell division and improving cell growth thereby strengthening your hair and improve its life period. ●All the ingredients used in this combination are natural and are approved by the regulatory authorities. The product does not exhibit any side effects and can be taken safely if recommended by the doctor. The nutrients and the food additives used in the product are well established for safety and approved by all agencies. So no adverse reactions have been reported related to formulation. The formulation and its ingredients are well tolerated and are compliant to patients.